Finally, here is the last Easter dress for this year. My oldest daughter, Anastasia, the only one who actually required a new dress, turns up her nose at anything too girly. She does like dresses and skirts, she just insists that they not be too poofy. 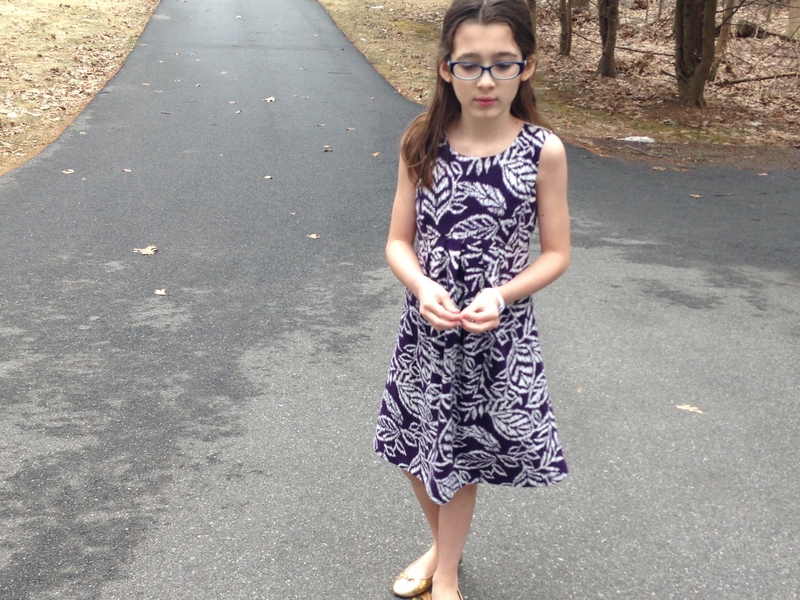 We flipped through patterns together, and Simplicity 1510 really caught her eye. Purple has always been her favorite color, so when I saw this linen Ikat leaf print at Joanns, I knew she would approve. Like my other girls, she is narrower than she is tall on the sizing chart. She measured about an 8 in width, and 10 in height. I slashed the bodice horizontally and added 1/2″ in length. I kept the armhole depth at the size 8, as she’s built somewhat like me—more petite in the upper body, but longer from the waist down. For the skirt, I simply extended the length down to the size 10. This is a cute little pattern, and I love the pleating at the waistline. The bodice hits close to the natural waist in the back, but curves up to a more empire shape in the front. I know it’s difficult to see the details because of the print, so check out the line drawing so you can see the style better. The pattern came together very quickly and easily, however, there is an error in the line drawing. It shows that the princess seams should line up with the pleats, but they do not. It does line up with the pleated edge on the inside of the dress, so just be aware of that if you’re looking to make this pattern. Other than that little glitch, I’m very pleased with the pattern! 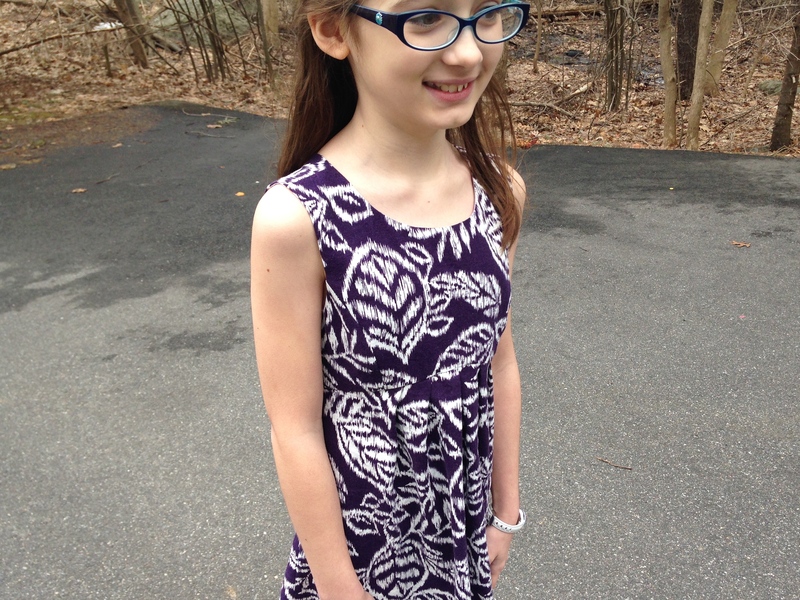 I find that in the McCalls and Simplicity kids patterns, you have to pay close attention to the body measurements (waist, chest, and height!) and ignore the size number. 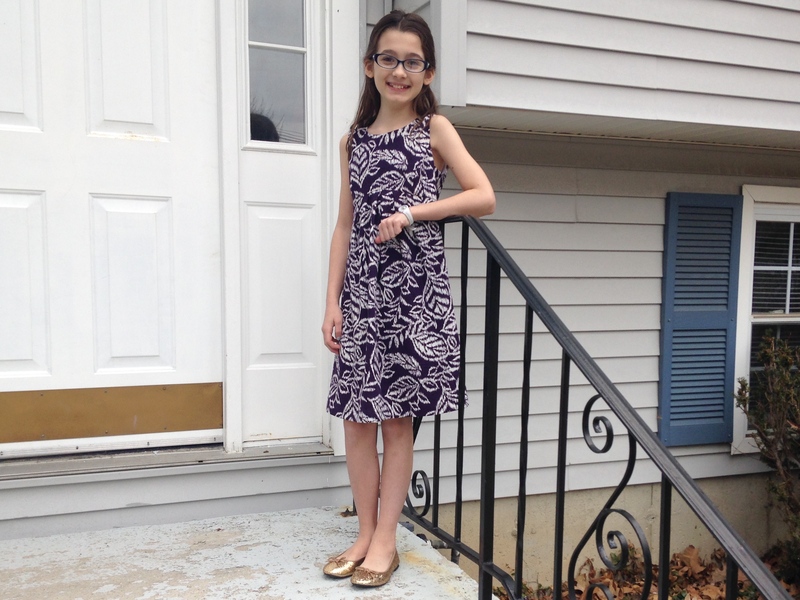 I feel kind of crazy for making a size 8 for my nearly 11-yr old, average-sized daughter, but there you have it. It fits well and she’s sure to wear it often. 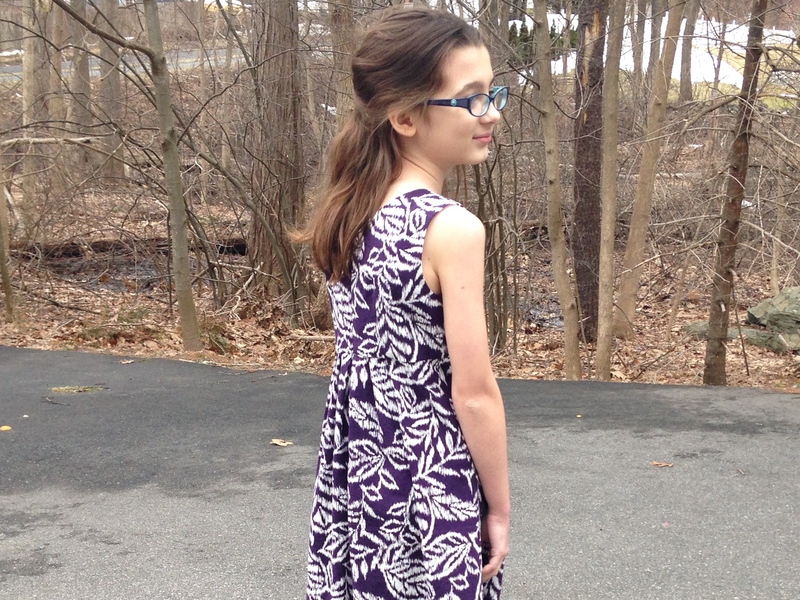 Whew, all that dress sewing just makes me want to sew more dresses… it’s so addictive! Now it’d be great if we could conjure up some Spring weather. The last few patches of snow are just now melting!